DHAKA, Feb. 24 (Xinhua) -- The mining work of a China-funded mega-river tunnel in southeastern Bangladesh started on Sunday. 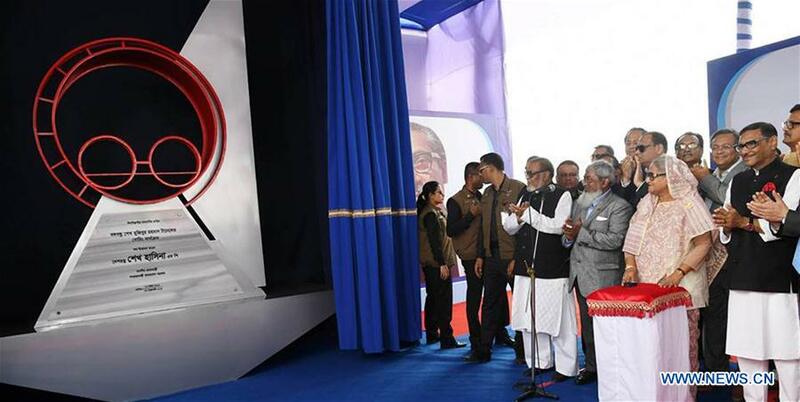 Bangladeshi Prime Minister Sheikh Hasina inaugurated the main structural work of the project by unveiling its foundation plaque on Sunday morning. China Communication Construction Co Ltd (CCCC) has been constructing the "Bangabandhu Sheikh Mujibur Rahman Tunnel" beneath Karnaphuli river with Chinese soft loans. The tunnel construction is to make Chattogram "One City Two Towns" based on a model of east and west Shanghai of China. The 3.4-km-long four-lane tunnel, the first of its kind in Bangladesh and Southeast Asia, will shorten the ride between Chattogram Airport to a planned industrial park from four hours to 20 minutes. Tianhe Mechanical Equipment Manufacturing Co Ltd, based in eastern China's Jiangsu province, in last September rolled off shield tunneling machine destined for Bangladesh to assist with the river tunneling project which will be implemented by 2022. The machine with a diameter of 12.12 meters weighing 2,200 tons will be used for opening the tunnel under Karnaphuli River. The west bank approach road will be 740 meters and the east bank approach road 4,952 meters. On June 9, 2014, Bangladesh and China signed a memorandum of understanding on the construction of the tunnel in Chattogram city, some 242 km southeast of capital Dhaka. Most of the country's export and import activities are being carried out through the city which has the country's largest seaport, situated at the mouth of the Karnaphuli River.